For the workforce on the road, the successful execution of each assignment in their daily to-do-list is vital. Any inaccurate delivery, any late intervention, any incorrect assessment of the situation, any wrong decision made in the field can cause a devastating setback. The Marathon™ Field Computer from LXE combines all of the mission-critical features and connectivity mobile workers need to perform successfully while operating outdoor. 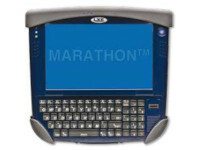 Combining unsurpassed ergonomics, “anywhere” connectivity, extreme ruggedness and superior performance, LXE’s Marathon™ represents the new benchmark in mobile computers for field applications.